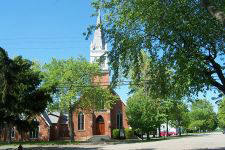 The St. John Evangelical Lutheran Church is located at the corner of Second Street and State Street at 4527 Second Street in Port Hope, Michigan. If you have any questions regarding our services, or would like to request information, please feel free to call or e-mail us. We look forward to hearing from you. The Lord be with you.